In Hanoi, our guide and one other man met us at a fairly modern and nice international terminal... immediately after we exited the business-class shuttle-bus ... and far ahead of the rest of the hoi polloi flying in coach - no offense to them - we've done it that way, too - - but in the case of Vietnam Airlines, the bump to Business Class was not that much more and so-highly worth it!! Our guide, in perfect English, told us to "follow him"... the other man took our passports and headed toward an office. We followed the guide and were escorted by an army official in uniform, through a locked gateway and out to the street. The other man ran up to catch us - delivered our completed passports with visas attached...and we were simply waiting for our van to take us to the hotel. Total time waiting for our Vietnam Tourist Visas? About three-minutes and thirty-seconds!!! Amy looked at her passport and ask me and our guide: "Hey....are we sure that was legal??" No kidding! It was so quick we had to have cut some major corners!! I gotta say, we really liked Hanoi. A lot. It's modern, but not too modern...the Socialist government has done a good job preserving parks and green-space...and - as of about 1986, when the government decided to open their markets (i.e., abandon communism for capitalism) - there are all of the modern amenities you could want. Including a very cool hotel across from Hanoi's famous Opera House... the Hotel De L'Opera Hanoi A fairly new hotel...kind of funky-chic...and very comfortable! We saw enough sights to get the feel of the place...The Temple of Literature, the Museum of Ethnology (there are 54 different ethnic minority groups living in Vietnam!!) - we had a meeting and lively discussion with a local professor of history and writer about the history of Vietnam - - it was much like going to a college lecture - - very cool and very informative.... We saw the Old Quarter... and finished the long day with a show at the Water Puppet Theater - - by far one of the highlights of our trip to Indochina!! The next day we began a three-hour drive to Ha Long Bay where we would board a cruise-sip (really a fancy "junk" - old but pretty cool!!!) It was the holiday celebrating the end of the Vietnam War (funny - you don't hear that term used in Vietnam!!) - and the traffic was brutal!!!! We were almost late for our 1:30 P.M. leaving time... but our guide was in contact with the boat and they knew all about the traffic problems! The boat was sort of old and funky...but our cabin was nice (albeit tiny!) - - the food was great - - sitting up on the sun-deck was amazing... but the most incredible thing about cruising ni Ha Long Bay is the scenery!! Ha Long Bay, situated in the Gulf of Tonkin, includes some 1600 islands and islets forming a spectacular seascape of limestone pillars. Because of their precipitous nature, most of the islands are uninhabited and relatively unaffected by human influence. One of the most amazing places I have seen on this earth! Anyway - if you go to northern Vietnam... YOU MUST TO TAKE A CRUISE ON HA LONG BAY! You will never regret it!! 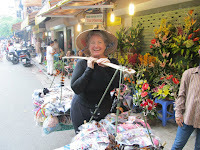 We drove back to Hanoi and boarded a plane for the old capital of the Kingdom of Vietnam: Hue. (It's pronounced "Way") We walked all over the Citadel, saw the Thien Mu Pagoda and had a nice cruise on the river. N.B. It was super hot and super humid...I thought me might die!! Then, another unexpected treat...we had lunch with a princess!! Princess Ngoc So was the daughter of Emperor Dong Khanh - when she married, her father granted her the land to build a home. Today it is one of the best garden houses and has been maintained largely in its original form. The home has an incredible set of beautiful gardens. The "princess" today is the great-granddaughter of the original princess...and she and her mother graciously fed us local delicacies and good cold beer!! Re the top photo: 'Looks like the Viet Nam shopping carts" do not have electronic devices that keep them in the parking lot. Did Amy Suzanne buy out the store???? While in Hanoi, did you visit the Jane Fonda Museum of Treason? Also, were you able to get a peak of John McCain's POW cell?